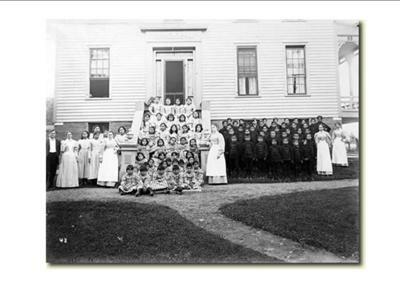 Residential and Industrial Schools were established in locations across Canada, predominantly in Western Canada for the purpose of "killing the Indian in the child." Over 150,000 children attended these residential schools up to 1996. Phil Fontaine, Grand Chief of the Manitoba Chiefs goes public as the first Indian leader to tell the story of his own abuse in residential school and calls for recognition of the abuse, compensation and an apology for the inherent racism in the policy. Several individual law suits are launched. Some residential school survivor groups are formed. The Royal Commission on Aboriginal Peoples recommends that a public inquiry be held to investigate and document the abuses in Indian Residential Schools. July - Phil Fontaine elected as National Chief of the Assembly of First Nations. AFN initiates negotiations with federal government officials for an out-of-court settlement for the residential school abuses. Consultative dialogues take place between AFN, survivors, federal government and church officials to set out the Guiding Principles for resolution of residential school claims. January - AFN and National Chief Phil Fontaine negotiate the Statement of Reconciliation with a Healing Fund of $350 million for survivors of residential schools. Government admits wrongdoing for the first time and apologizes to residential school survivors in the Statement of Reconciliation. May - The Aboriginal Healing Foundation is established. A class action is commenced for a single Indian Residential School in Ontario. Further class actions launched by law firms. Department of Indian Residential Schools Resolution Canada is formed to deal with the out of court settlement of residential school abuse claims. November - Canada launches an Alternative Dispute Resolution process. March - AFN and the University of Calgary Law School organize a national conference to examine the ADR process, and delegates find it to be seriously flawed. a more comprehensive and fair and just process for the settlement of individual abuse claims. January - AFN begins discussions with officials to consider the elements of the AFN Report. May 30 - National Chief Phil Fontaine signs the Political Agreement with Canada. The Agreement appoints the Hon. Frank Iacobucci to be the government representative in final settlement negotiations. The Agreement states that the AFN will play a "key and central role" and that the AFN Report will form the basis of the Settlement. July - Negotiations with all parties commence in various locations in Canada. November 30 - All parties to the negotiations sign the Agreement in Principle, incorporating all of the key AFN Report recommendations. All parties commence negotiations leading towards a final settlement agreement. April 24 - All parties sign a final agreement, which awaits final Cabinet approval. Unfortunately, according to the agreement, any survivor that passed away prior to 1998 doesn't qualify. The governemtn says "Oh Well"! As of June 15 2010 The Truth & Reconciliation Commission has begun to hear the testimony of THOUSANDS as to the abuses suffered in the Residential School System. The testimonies will continue through Friday June 18th...LET THE TRUTH BE KNOWN! PEOPLE NEED TO KNOW THIS!